If you are seeing coloured blocks in your picture the problem may be caused by a weak signal or an excessively strong signal. This issue is usually related to the received RF broadcast digital signal (or received satellite signal). You can check the received signal strength and quality in the Support menu on the television. The ideal signal strength should be somewhere between 40%-80% and the signal quality should be reading zero errors or as near to zero as possible. If the signal strength is low please check that your antenna has not moved or become damaged. If you are using an antenna amplifier make sure the connections, coaxial cable, and power cable are all in good condition. If your signal strength is too strong then you will need to fit an inline signal attenuator. These come in various strengths in steps of 3dB, and can be used in any combination to achieve the desired signal strength. These can be purchased from any reputable antenna installer and from electronics retailers. Note: if you have satellite TV you may be able to improve reception by adjusting your satellite dish. See the user's manual of your satellite dish or digital set-top-box for instructions, if possible, or contact your satellite TV provider for further details. You can try attaching an in-line signal amplifier (also called an RF amplifier or a signal booster) to the cable connecting your antenna, cable wall outlet or cable box to your TV. Amplifying the signal will often improve the picture. In-line amplifiers can be purchased from electronics retailers. 2. Press the MORE button. 3. 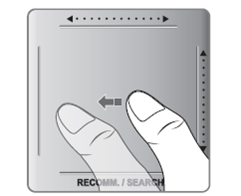 Using the touch pad to navigate on the virtual remote control on screen to highlight the MENU button icon and then press the centre of the touch pad. 4. Highlight Broadcasting and press the centre of the touch pad. 5. Highlight Auto Tuning on the list and then press the centre of the touch pad. Press the centre of the touch pad again. 6. Highlight Start and then press the centre of the touch pad. 7. When the auto tuning has finished press and hold the RETURN button to close all the menus. Press the MENU button on your standard remote control. Why is the TV is hot? Getting used to Samsung IR Extender cable.